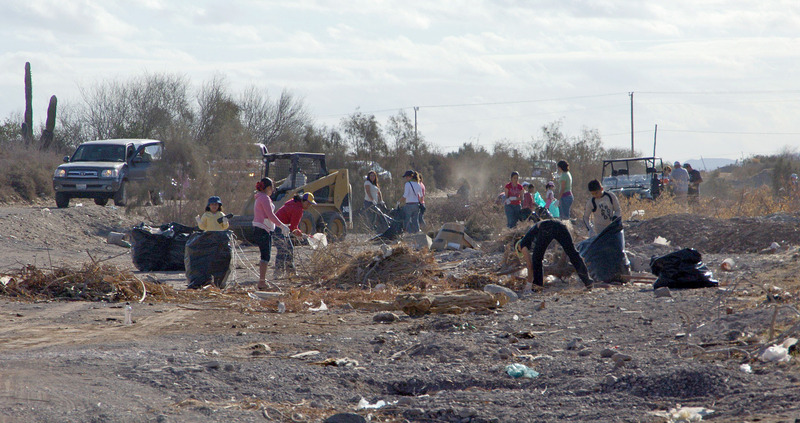 Earth Day – Loreto Pride were celebrated on April 10, 2011 with a community cleanup of the Arroyo Candeleria. 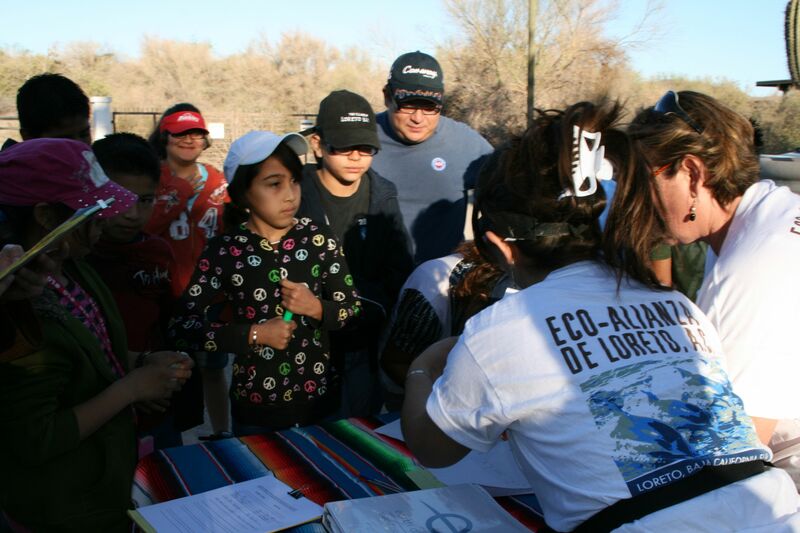 The event was sponsored by the Waterkeeper Alliance, Parque Nacional Bahia de Loreto, Loretanos por un mar lleno de vida, and Eco-Alianza de Loreto. A.C.
As in years past, the arroyo had been used by those less educated about the affects of garbage as a dumping ground for unimaginable waste. During the dry winter season, the arroyo serves mostly as a road from Mex 1 into the beach front community, but in the rainy season, it can/does become a roaring torrent, pushing everything in its path into the Sea of Cortez. Hence, the need to remove the accumulated refuse, and save the waters from unnecessary pollution. There was grousing in the community about ‘cleaning up “that” place again’ … accompanied with ‘they’re just going to fill up up with trash when we’re finished’ … but the choice of the arroyo was the right one. Intelligent and needed, no matter who caused or created the refuse. At the end of the day, it was the sea that won – and those who live near it and call upon it for their livelihood. Waste management is an on-going concern for every community, not only pickup, but what to do with our collective garbage once it leaves our doorstep? It’s not only a residential problem, but a commercial one, as well. The nuclear fuel crisis in Fukishima, Japan heightens awareness of exactly what we humans create, and the havoc we face in disposal. Batteries, florescent tubing, toxic motor oils, paint thinners, industrial cleaners, acids …substances poisonous enough to cause serious and even deadly harm to man. We create them, we use them, but what do with do with them when we are ‘done’? On Earth Day this year in Loreto, something wondrous happened. Over 200 school age youth arrived at the registration desk, ready to put their energies into their community. They were not the creators or the garbage mess, nor did they necessarily live in close proximity, but there they were, ready to put muscle and heart into protecting the waters that they love. Over 200 Local Youth Signed Up to Help with the Cleanup! Rubber gloves and contractors trash bags were disseminated at both registration, and along the cleanup route. There was a water truck to make sure that everyone was hydrated, and multiple pickup trucks to cart the collected refuse to the dump – where is should have been deposited in the first place. They brought friends, cellphones, and great attitudes. In fact, I don’t think the arroyo has ever been cleaned as quickly as with this small energetic army! There were expected ughs and gags. I mean, not only garbage but dead animals were in the mix. SIDEBAR : As I sat in the dirt trying to pick up as many tiny fragments of glass as possible, I was struck by the beauty of the sunlight on the shards, and my thoughts was – wow – if I were a fish or a dolphin or whatever – I’d be attracted by the shimmering beauty and for sure take a bite! Sudden – or maybe agonizingly slow – death. … and still more : old bricks, broken tiles, trashed appliances – and/or parts of appliances, motor oil cans, paint cans, foam cups, foam bits and pieces, school books, notebooks, papers, cigarette butts, plastic trays (does the uses of plastic never end? 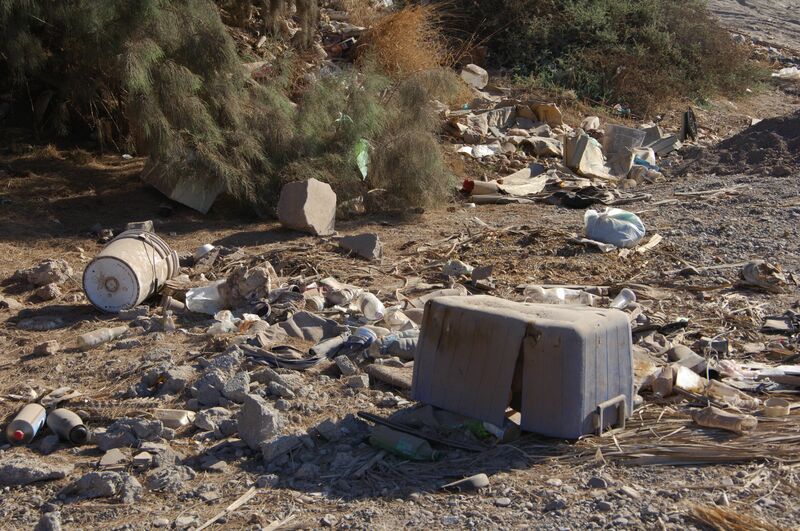 ), plastic water bottles, lamp shades …… There was more – over 30 filled trucks and trailer trips to the dump! And when we were done? Amazing. A clean arroyo, just as it should be. Filled with mesquite and paloverde. For a few minutes, we all sighed, smiled, and congratulated ourselves on our work… and then set to thinking how to educate those who do not understand the relationship between their actions and the health of the seas. The crowd of dusty dirty volunteers headed up the beach to Rancho Jaral, where a celebratory barbecue was held. Hats off to all community volunteers, including the Marine Park, ZOEFEMAT, Hugo Quintero, Tony and Linda Kinninger, Pam and Kent Williams, Mary and Nick Lampros, Catharine Cooper, the students and their participation in the EAL workshop under the direction of Edna Peralta, Program Administrator for Education and Outreach, Horacio Gabrera – Exectutive Director of Eco-Alianza, and Gaby Suarez – Program Director for the new Waste Management Program. 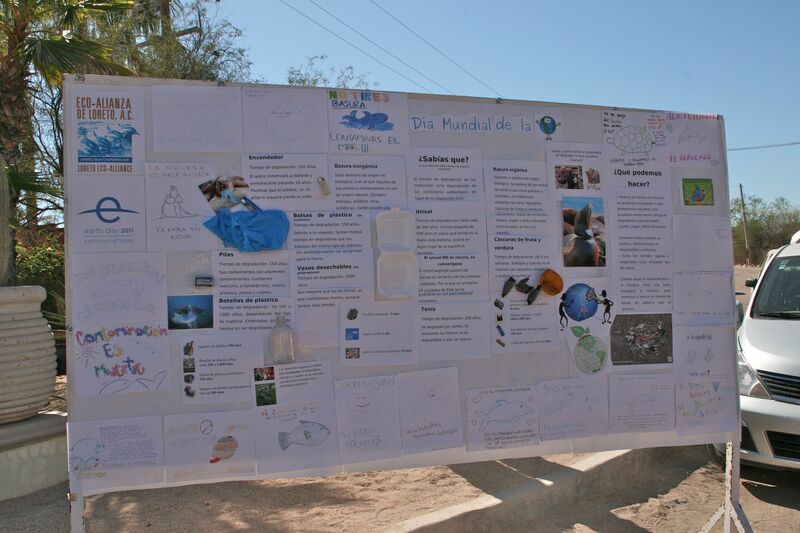 This entry was posted in Baja Living, Clean Water, Desert, Earth Day, Environment, Estuary, Family & Friends, Waste Management and tagged Earth Day, Eco-Alianzia de Loreto, Loreto National Marine Park, Loreto Pride, Sea of Cortez, Waterkeeper Alliance. Bookmark the permalink.